February 10, 2019: The grand opening of the MCC’s beautiful new, state-of-the art, two-theatre complex—the Robert W. Wilson MCC Theater Space—gives what was once a quiet stretch of Hell’s Kitchen real estate yet another reason to celebrate as a growing theatrical/cultural center. Bunched together on W. 52nd and W. 53rd Streets near Tenth Avenue we now have the MCC, A.R.T./New York Theaters, the Ensemble Studio Theatre, INTAR, and Ars Nova. And just a short distance away, on W. 51st Street, there’s the Irish Arts Center, which sometimes stages plays, and is running a capital campaign for a new building on Eleventh Avenue. 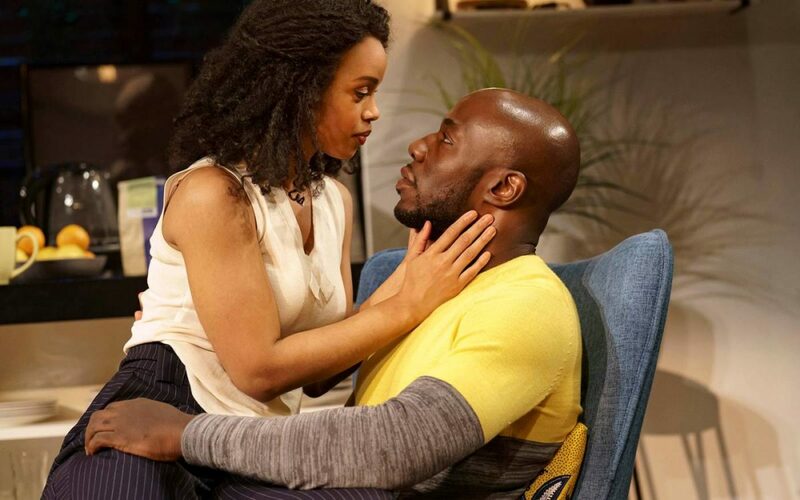 I’m forced to admit, though, that the new MCC theater’s debut production, Loy A. Webb’s The Light, may not be as good a reason to make the trek from the nearest subway as to see the place itself, with its attractive frontage, sizable lobby, and sparkling restrooms. All are huge improvements over the company’s previous home at Greenwich Village’s Lucille Lortel Theatre. The Light, briskly staged by Logan Vaughn, is located in the 100-seat Susan and Ronald Frankel Theater, right across from the Newman Mills Theater, where the musical Alice by Heart will soon open. Kimie Nishikawa’s set at the Frankel is arranged in the three-quarters round but the black box space is adaptable to multiple configurations. 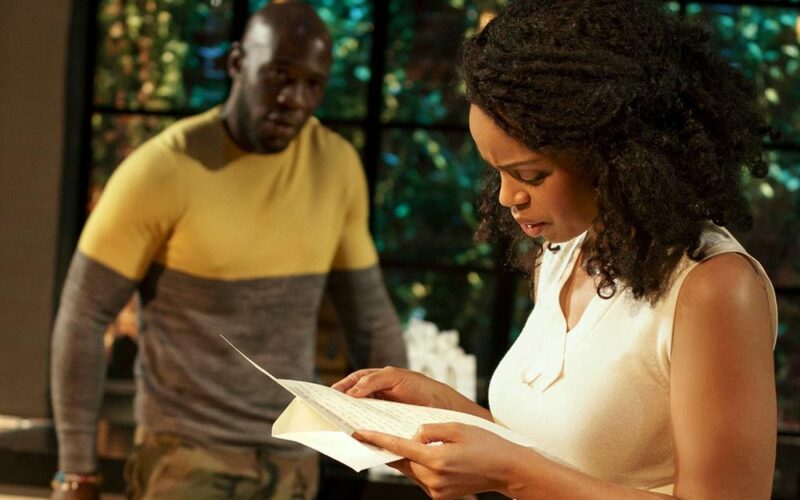 Playwright Loy A. Webb, who is also a Chicago-based attorney, is interested in social justice; in The Light she allows that interest to supersede the writing of a convincing play about what appears to be an issue of significant concern among black women, but which may not be that familiar to non-black audiences. 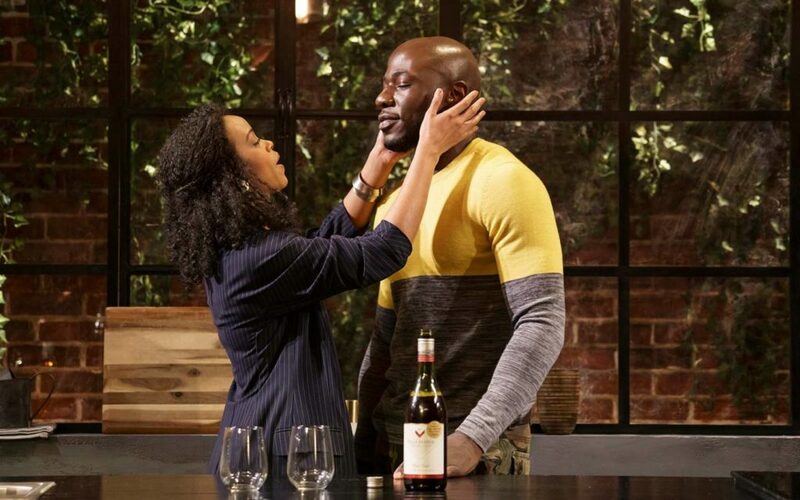 It’s what Genesis (Mandi Masden, Jitney), one of the play’s two mid-30s, African-American characters, refers to as black male privilege. White privilege of the male persuasion is a theme of plays like Straight White Men, but privilege doesn’t have a racial preference. 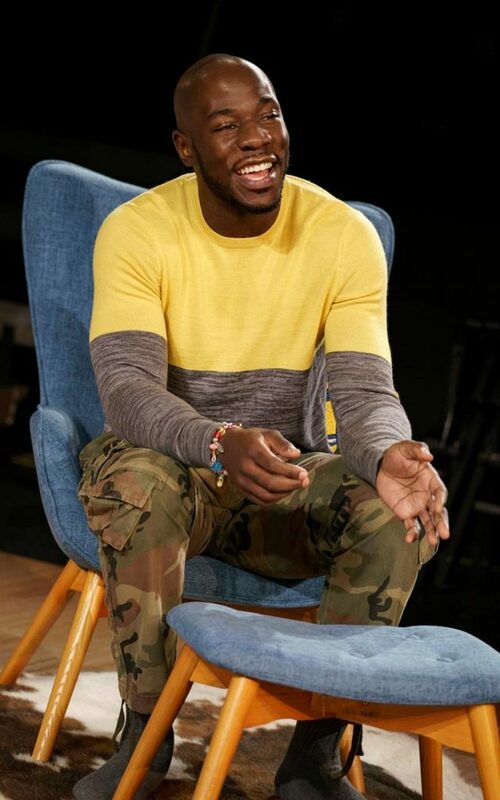 The other character is Rashad (McKinley Belcher III, The Royale), a sleekly striking slice of muscular manhood who lives with Genesis in a coolly stylish, white-walled, apartment in Chicago’s Hyde Park, dominated by a long, black granite-topped island, and smoothly lit by Ben Stanton. It’s the eve of Rashad and Genesis’s second anniversary as lovers, and Rashad, a college football star turned fireman, is preparing to spring a surprise on her. From the moment of his lively entrance into the empty apartment, an air of light comedy fills the room, only to increase after Genesis, a lovely, well-dressed (by Emilio Sosa) school principal, arrives and the pair banter, he in conventional black dialect (an affectation more than a necessity), she with more educated discourse. 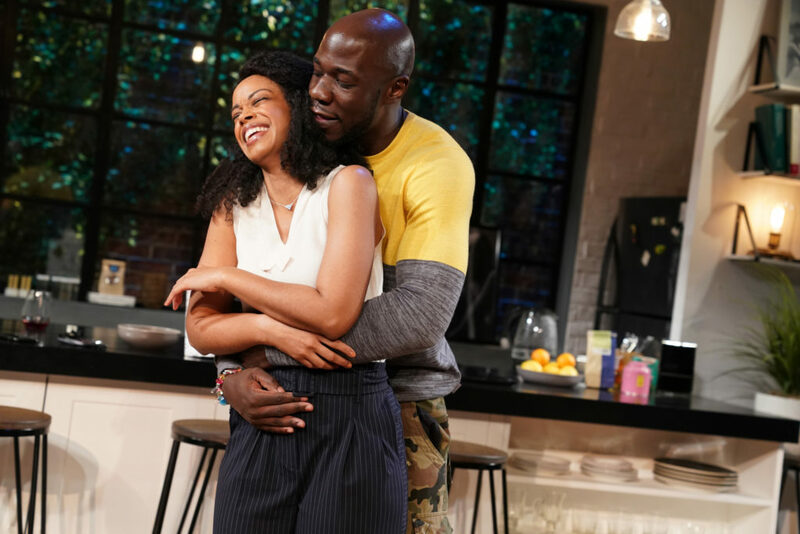 For the hour and 15-minute play’s lighthearted first third, we watch this handsome couple chat and quip, noting their mutual admiration, attraction, and affection, until Rashad surprises Genesis with a marriage proposal, a ring, and, what really freaks her out, hard-to-get tickets to a concert featuring her favorite female singer. When she realizes that the concert—intended to bring violence-torn Chicago together—is headed by a male singer named Kashif, she refuses to go. What follows abandons any sense of Tracy-Hepburn repartee and descends into a class in Polemics 101. Loy has set us up with romantic comedy only to turn her lovers into combatants spatting over Genesis’s resistance to doing anything to support Kashif, regardless of his charitable and socially positive activities. Her resistance stems from something unforgivable she claims he once did to a “friend,” that old alarm-bell word. Suffice it to say that the latter two-thirds are a vitriolic debate between the lovers over her disgust at what she considers Rashad’s black male privilege in supporting men who have done what she pins on Kashif. The back and forth forces us to agree and sympathize with Genesis’s point of view. Other racially charged topics arise but the one about what Kashif did stands out. Even if we accept Genesis’s revelations, though, it’s difficult to believe that a woman as knowledgeable about the dimensions of this problem, and so passionate about it that she’d break up with the man whose proposal she just joyously accepted, would never previously have mentioned her concern. Indeed, since the names Kavanaugh and Ford are mentioned several times, it’s clear that the opportunity to at least weigh in—not on Ford’s credibility, which they did discuss, but on its implications regarding black men’s treatment of women—was abundantly available, even without Genesis mentioning anything personal. The excellent performances of Belcher and Masden, both as lovers and as debaters, give great vitality to the dispute but their artistry only underlines the play’s contrivances, regardless of the resemblances to recent headlines. I felt sorry to see this appealing couple lose their cool for reasons reeking more of an urge to wrangle over a problem than because of an organic necessity. None of this is to deny the considerable interest in what Rashad and Genesis actually say. 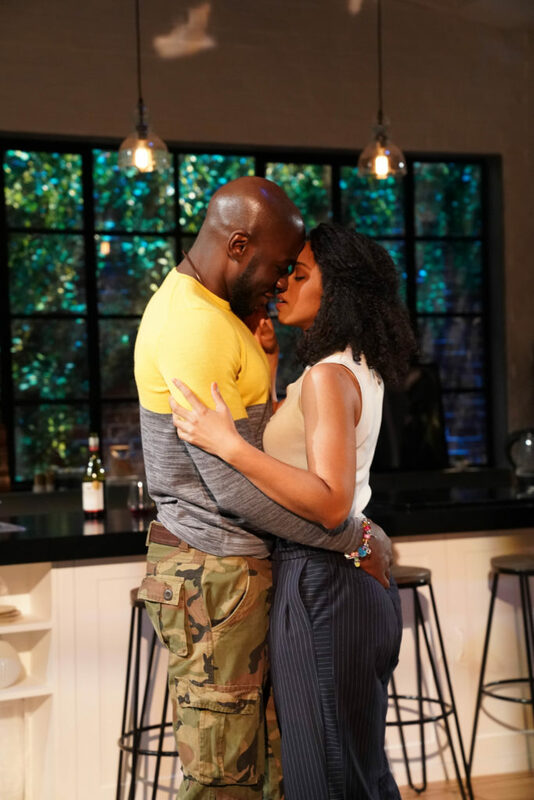 It’s just that the play comes off more as an excuse for a discussion than as an honest exploration of two people who, despite all that ties them together, are really not as well-matched as they believe. Polemics are fine but are sometimes more effective on the page than on the stage.